For many Austinites this picture will look all too familiar- it’s chips and green chile queso from Torchy’s (Damn Good) Tacos. As far as I’m concerned, this is the pinnacle, the apex, the apogee of man’s quest to create the perfect cheese-y dip. The melted cheese is studded with diced roasted New Mexico chiles and then topped, oh-so-cleverly, with a dollop of guacamole, queso fresco, cilantro, and a shot of Torchy’s habanero diablo sauce. This stands head and shoulders above the standard velveeta + rotel queso of my youth. I don’t know how they did it, but Torchy’s queso never congeals or gets a rubber top-skin, even after being refrigerated! They’re mad queso geniuses, I guess. Heat some tortillas in a pan. 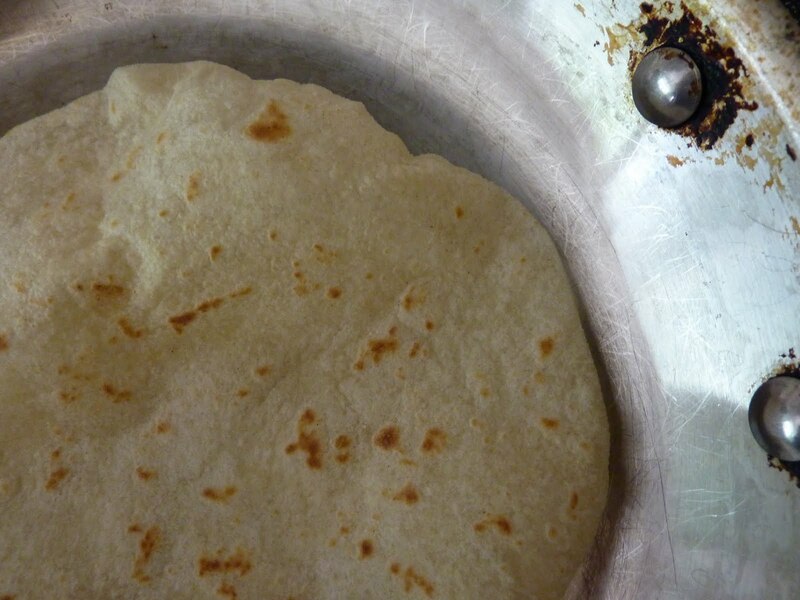 We prefer Central Market’s flour tortillas, which are practically inedible straight from the bag, but completely amazing when grilled or griddled on both sides until they’re spotted with golden brown dots and puffy. 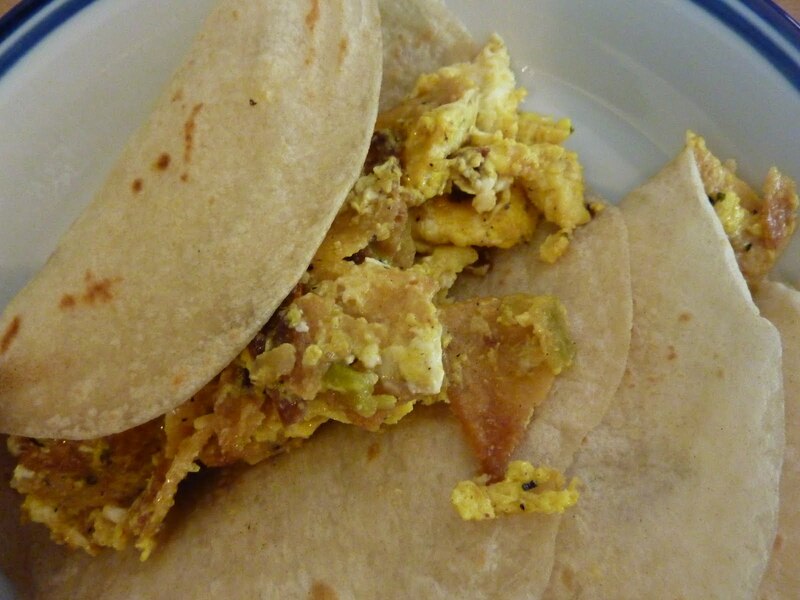 Wrap your tortillas in a kitchen towel or aluminum foil to stay warm while you make the migas. 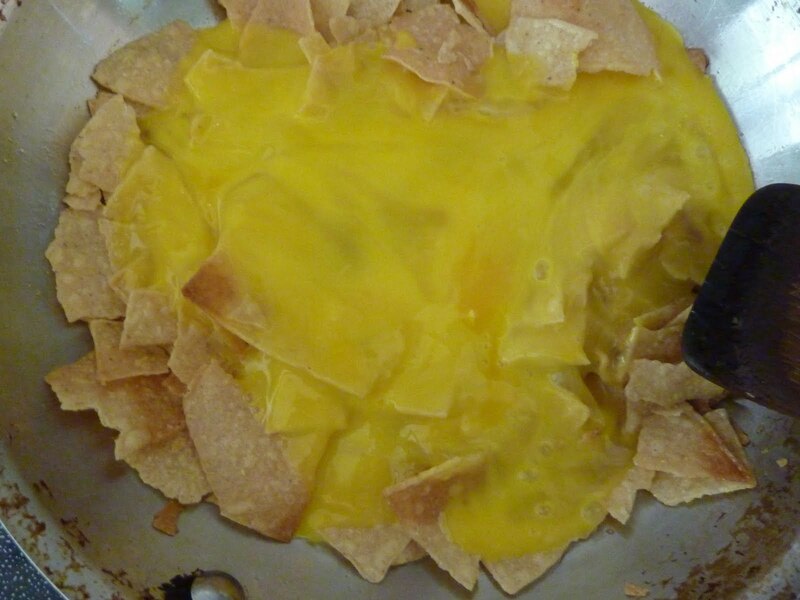 Crack 4 or 5 eggs into a bowl, and get out some vegetable oil and your leftover chips and queso. 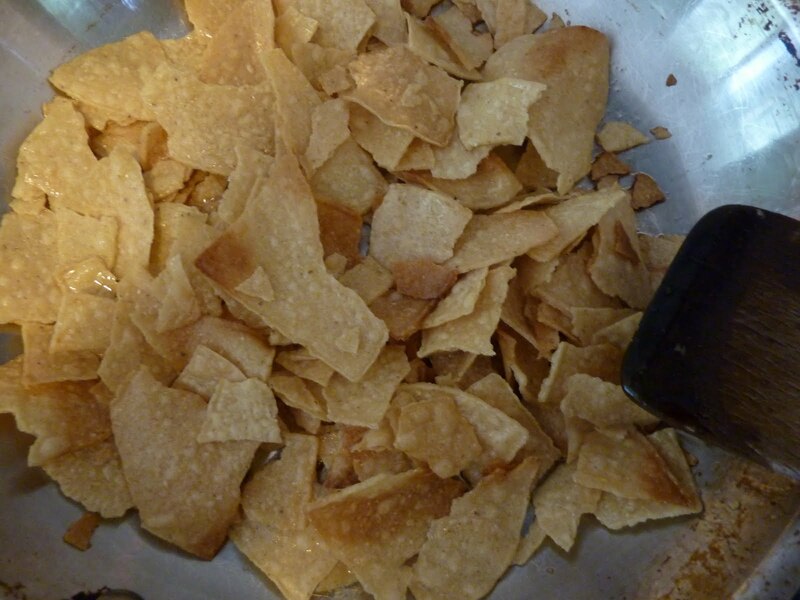 Put a tablespoon or two of vegetable oil in a skillet over medium heat, and then crumble in several large fistfuls of tortilla chips. Toss so the chips are coated in the oil, and cook a minute or two, so that the chips start to toast and turn brown in places. 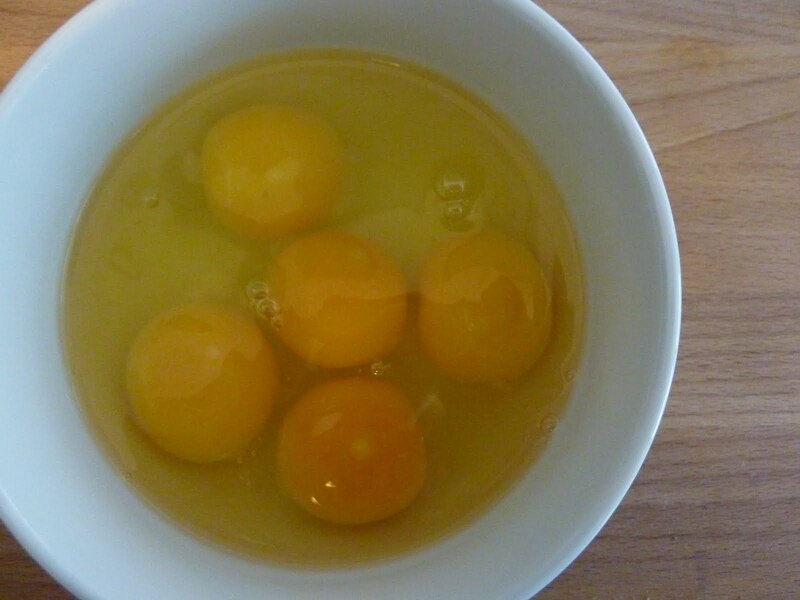 Beat the eggs and then add them to the pan. (I usually pull the pan off the heat for this part, so the eggs don’t overcook.) 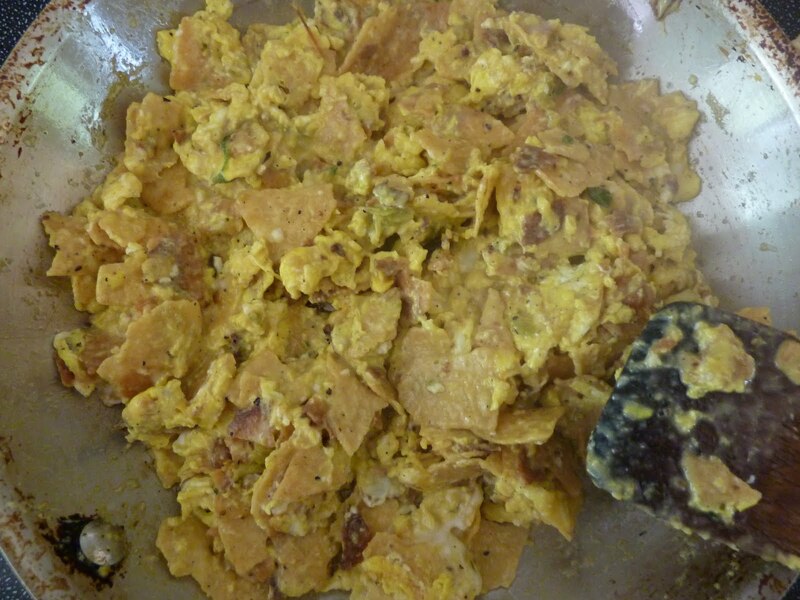 Fold the eggs into the toasted chips and continue turning until the eggs are mostly scrambled. 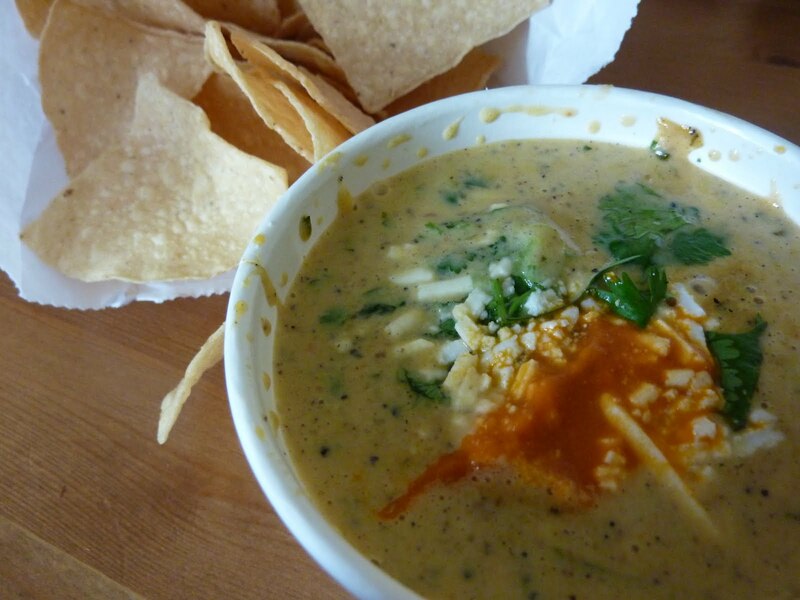 Add your leftover queso to the pan and toss again, so that that magical queso covers everything. It’ll look something like this! 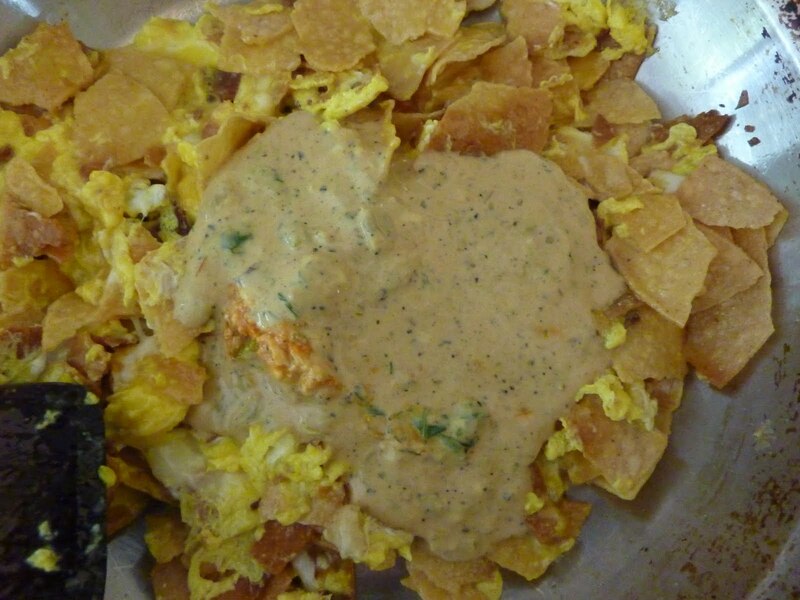 You could eat it just like this, or serve the migas as tacos in warm flour tortillas. I hope you like it! It's…that's…but that's…OK, so Nmhz got there first, but that was so completely my thought as well! Parallel evolution? Jews who brought their tradition to Mexico? Mexicans who brought their tradition to, er, wherever Jews were? Either way, I'm sorely tempted to try it (and so very afraid that my wife, who hates matza brei, won't eat it). i'd be more inclined to attribute it to parallel evolution. just like almost every cuisine has some spin on the dumpling (empanadas, pierogis, gyoza, etc), maybe there's just something instinctual about mixing eggs with crispy carbs! Tahnan- i hope you try it and that your wife loves it! Sadly, we lack a Torchy's Tacos in this city. Perhaps I'll try it with some imperfect queso. (Perhaps I'll try making queso, emboldened by my having learned how to make tamales earlier this year.) We'll see how it goes. Meanwhile, of course, I'm still making that spinach dip, though it's now got artichokes and is somewhat less “dip” and more “sandwich spread”. and oh man! about the artichoke-y spinach dip! how brilliant to spread it on a sandwich! must try soon.